Cable TV: What’s watched. What’s actually produced. And Why. 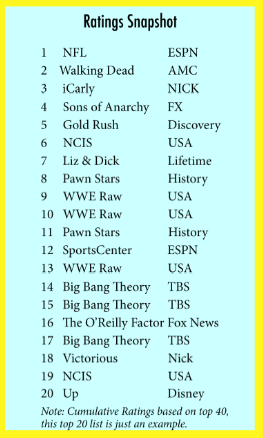 Looking at the Cable TV Ratings last week, I was pleasantly surprised to see the all the scripted content that made the list since we so often associate Cable TV with reality & unscripted programming. It got me thinking…why does cable TV, the entertainment category that delivers the best that entertainment has to offer (think Mad Men, Sons of Anarchy, Walking Dead, Phineas & Ferb, etc. ), also delivers such crap? Here’s is another question: Why is it that Cable TV Producers so often sit in pitch meetings with network execs who profess to know it all (from their brand to their audience) while those same networks continue to deliver primetime shows with under a 1.0 despite a reach of 100 million homes?! The answers to these questions are not the fault of one position or department at any cable network. The answers are tied to a cyclical process of cause and effect. Common financial wisdom says cable networks require (1) inexpensive unscripted shows with (2) loud characters that will maintain viewership despite a lack of production value in order to (3) maximize profits. This is the result of downward pressure on budgets from the bean counters having more influence than the upward pressure of solid creative from the programmers. What ensues is not that different from one common result of the “Walmart Effect” at retail in which the cable networks then place the entire burden of this downward financial budget pressure on the suppliers. In this case, the immediate casualty of the financial pressure is the producers’ creative rates and fees. Guess what happens next? No longer able to make money from the creative fees, most unscripted Cable TV Producers are then forced to treat their business like glorified rental shops—because the only place they can make money is from renting their own production or post-production equipment on the shows. Outside of the business, most people don’t realize that things like equipment rental and post production services has largely been brought in-house by the cable TV producers because it’s the only place they can continue to charge the networks and still make some money. Not too long ago, the business of renting cameras, lighting, and grip went to rental houses—and the business of post-production services went to dedicated post houses. But no longer. Now the quality of the final master tapes that get telecast has surely been compromised because most cable TV producers simply don’t own the same high-fidelity equipment as the old-school dedicated suppliers—but nobody on the network side is complaining too loudly because they are getting away with no longer paying creative fees. The resulting unscripted television is like a Big Mac and here’s why: I love the smell of a Big Mac. And if you put a Big Mac in front of me, you can be damn sure I’m going to eat it. And let’s face it—during the moment of eating—a Big Mac delicious. But given a few minutes to think about it… They’re not good for me, they’re not as inexpensive as I thought, and I usually don’t feel that good after I eat it. I’m not snobby enough to deny that Big Macs near me don’t get eaten. But if you ask me what I want for dinner, my first choice is Italian or Steak—not Big Macs. The same goes for most unscripted cable television. Over a short period of time, much of the unscripted Cable TV landscape has become filled with “Rental House & Casting Agent” production companies that sling Big Macs versus quality programming. Oddly, I’m now in the mood for a Big Mac. And sharing this craving is likely counter-productive to the point I’m trying to make! A Cable TV Proucer’s business-model that’s rooted “equipment rental” and who’s sales force is focused only on “casting” will eventually compromise the actual creative—which is why we’re here to begin with. This is the unfortunate truth for the cable networks that created this cycle to begin with. And this idealist believes that soon the audiences with migrate back to quality. 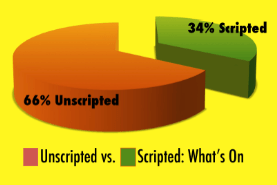 Last week on Cable TV—what percentage of viewers do you think watched scripted versus unscripted programming? 73% of all Cable TV viewers watched scripted programming while only 27% watched unscripted programming. So the migration towards quality seems to already be happening. Check out the infographic below. To figure this out I looked at the ratings of the top 40 shows on cable TV last week, and then analyzed them against a few different cumulative measures. Again, check out the Infographic. The really interesting thing is that unscripted shows (reality, etc.) aren’t that cheap to produce when you consider the cumulative production dollars that networks collectively spend to make many more shows that ultimately attract fewer viewers than cable TV’s scripted programming. What’s also amazing is the ratings success of categories like sports entertainment in which there is just one player—WWE. What is sports entertainment you ask? It’s event-based scripted sports-theater with zero competition since we lost the WCW and XFL, both after 2001. Remember the XFL? Amazingly, the first game of the one-season XFL had over 14 Million viewers on NBC before quickly being considered a failure. 14 Million viewers is a failure? My times have changed. During the same week ending on 11/25/2012 I then looked at the primetime schedules of the top 85 cable networks, and analyzed their programming hours against the same cumulative measures that I looked at for ratings. I did this to see if scripted programming was simply programmed more than I thought in order to have this 73% market share over unscripted programming. It’s not. Wow! 66% of the total unscripted programming hours on cable TV are arguably only getting 27% of the audience. Did we learn nothing from broadcaster NBC’s misstep in moving Jay Leno to 10pm simply cause it’s cheaper than producing scripted dramas? Now take a look at the Purple and Blue bar-chart above. 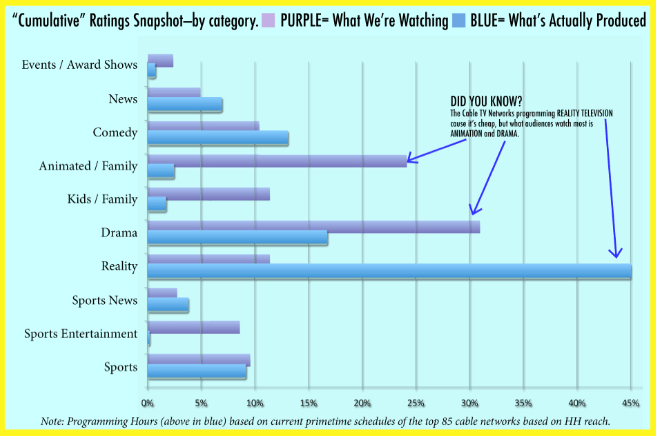 Any category where Purple is higher than Blue is possibly a programming opportunity. Anything where blue is higher than purple is arguably saturated. Interestingly, sports is the only cable TV entertainment category that seems even close to its sweet spot of programming hours versus actual ratings. 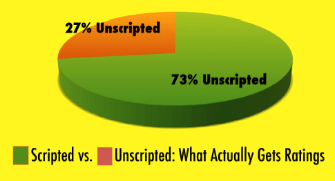 For the record and for the purpose of this blog—we classified sports as unscripted programming. The cycle needs to break and the programming challenge needs to shift from (a) finding the loudest reality star in order to command a bigger piece of the pie, to (b) developing excellent creative programming in order to create a bigger pie. Ending this article on a positive note—kudos to AMC, USA, Nick, TBS, Disney, TNT, Cartoon Network, Hub, FX, HBO, Showtime, TV Land, We, Lifetime, Hallmark and a few others (from a long list of 75 cable TV networks) for concentrating on creative quality instead of Big Macs.